July 16, 1993, L. G. Crabo. 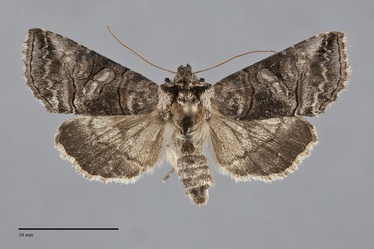 Abrostola urentis, the Nettle Looper, is a small to medium-sized gray moth (FW length 12 - 15 mm) with a gray forewing with raised black scales along the lines and spots and a giant orbicular spot that flies in forests in southern British Columbia and west of the Cascades during the summer. 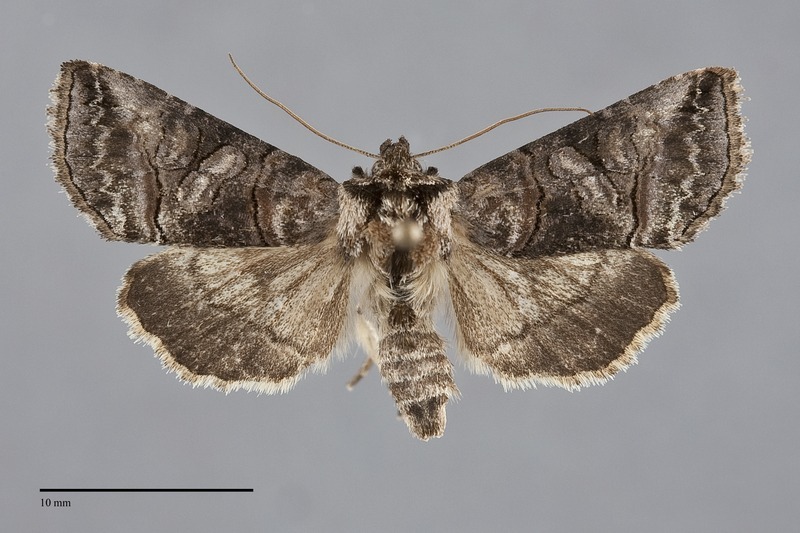 Members of the genus Abrostola differ from other members of the subfamily Plusiinae in that they lack a metallic stigma on the forewing. The forewing margin is scalloped. The ground color is mottled dark gray, slightly darker in the median and terminal areas. A black spot spans the subterminal area at the apex. The antemedial and postmedial lines are similar, black next to the median area and brown outside the median area, filled with the ground color. The antemedial line is smoothly excurved. The postmedial line is slightly concave toward the wing base below the reniform spot and very faint near the costa. The subterminal line is pale gray, finely irregular and nearly straight across the wing. The spots are black in outline with filling of the ground color and paler gray. The orbicular and suborbicular are fused to form a very large oblique figure-eight-shaped spot with pale gray central filling. The reniform spot is also large, ovoid, touching the orbicular spot. The terminal line is black. The fringe is gray. 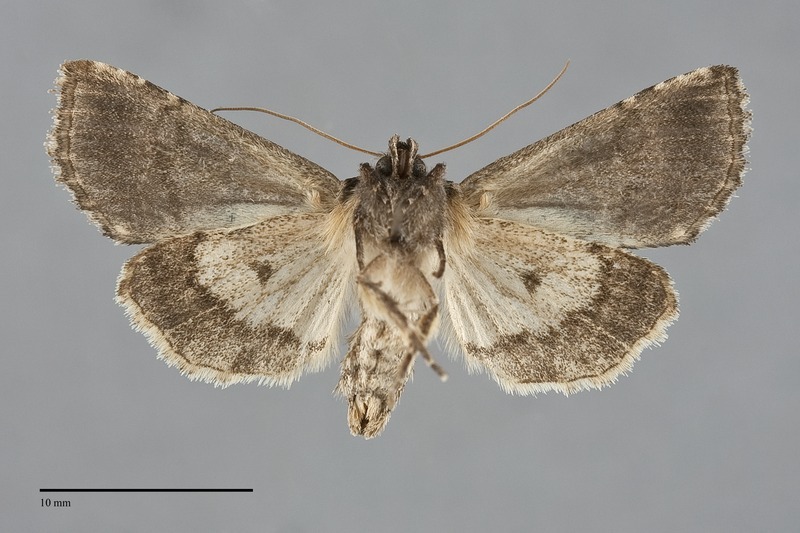 The hindwing is gray with slightly darker discal spot, postmedial line, and marginal area. The hindwing fringe is cream with patches of gray scales. The head is dark gray, the collar is patchy pale brown-gray with a dark gray edge, and the rest of the thorax is gray with long tan tufts. The male antenna is filiform. This species can be recognized by the large eight-shaped orbicular spot, gray color, and paired black and brown forewing lines. The identity can be confirmed by viewing the raised black scales under magnification. Larvae have prominent dark-brown, diamond-shaped spots on the back of the first two abdominal segments. This species is widely distributed in moist habitats. In the Pacific Northwest, it is narrowly restricted to wet habitats west of the Cascades, and is common in coastal rainforests and in the riparian zone along creeks in mixed hardwood forests at low elevations. It has not been found in association with nettles in dry steppe habitats. The Pacific Northwest populations are found across southern British Columbia south through the western parts of Washington and Oregon. Abrostola urentis has the largest North American distribution of the four species in the genus Abrostola. The range extends to the Atlantic Coast across the boreal zone of southern Canada and the adjacent United States, occurring as far north as central Alberta and Nova Scotia and as far south as the mountains of eastern North Carolina. The range extends south in the Plains States to Kansas and northeastern Colorado, but it does not occur in the Rocky Mountains. Crumb (1956) collected many larvae in September at Puyallup, Washington. The adults emerged the following spring. The food plant is stinging nettle (Urtica spp., Urticaceae). Adults fly from mid May on Vancouver Island to mid August east of the Cascade and Coast Range Mountains. This species is nocturnal and comes to lights.